Multiple studies show that immunity enzyme defends against tuberculosis infection. A study by researchers at UT Southwestern Medical Center has identified how an enzyme involved in protecting the body from pathogens senses Mycobacterium tuberculosis (TB), a bacterial pathogen that infects millions of people worldwide and causes about 1.5 million deaths annually. The team state that the new finding has potential implications for the development of immunity-based therapies to treat tuberculosis, which typically takes months to eradicate and has become increasingly resistant to antibiotics. The opensource study is published in the journal Cell Host & Microbe. The researchers explain that the enzyme, called cyclic GMP-AMP synthase (cGAS), acts as a sensor in the immune system and is essential for defense against the tuberculosis bacteria. When infected with TB, mice lacking this enzyme succumbed much quicker than mice with normal cGAS activity in the current study. Based on the data finding the team believe that modulating cGAS activity could be a novel approach to therapy. They go on to state that there remains a dire need for new therapies against tuberculosis, and thus identifying pathways to stop the pathogen is of vital importance. TB is a bacterial infection with widespread global reach, state the team. About one-third of the world’s population is infected with the bacterium, though most infected people have no symptoms and may not know they have it. Tuberculosis is the No. 1 cause of bacteria-related death and also the leading cause of death for people infected with HIV. TB is spread by airborne personal contact with an infected individual. While TB is prevalent in underdeveloped countries, about 12,000 to 15,000 new cases arise in the U.S. annually, mainly in people who are immigrants from counties where TB is more endemic. The researchers discovered the cGAS enzyme and how it orchestrates immune responses to DNA in 2012 . They hypothesize that the current study finding that the cGAS pathway is important for sensing and defending against TB infection suggests that this pathway may be harnessed to develop better vaccines and therapeutics to protect people from this dreaded disease. The current study showed that when tuberculosis is detected by cGAS, a compound called cyclic GMP-AMP (cGAMP) is produced. 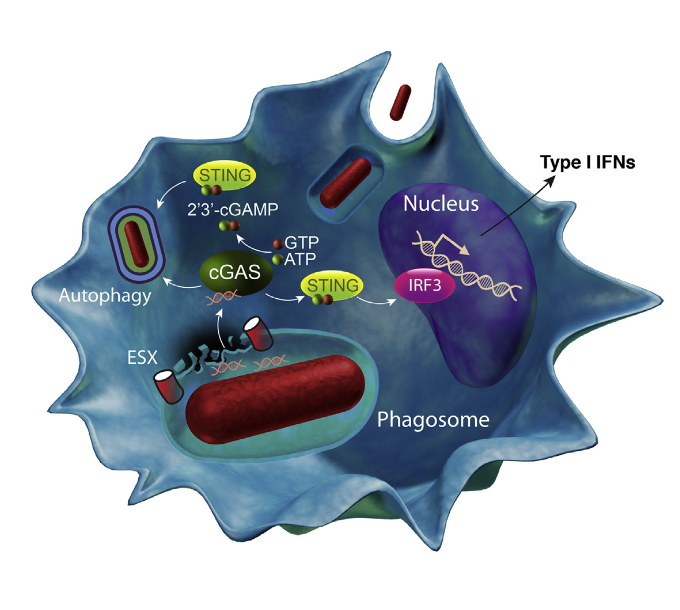 cGAMP then initiates a cell signaling cascade that triggers production of interferons and cytokines and activation of autophagy, an important host-defense mechanism. Thus, cGAMP could possibly be leveraged as a biomarker for active disease and therapy response, and could be used as an adjuvant for developing an effective TB vaccine or therapy. The team surmise that the work and two similar studies also reported in Cell Host & Microbe point to cGAS as having strong potential for immunity-based therapeutics to combat TB, and potentially other infectious diseases. Activation of the DNA-dependent cytosolic surveillance pathway in response to Mycobacterium tuberculosis infection stimulates ubiquitin-dependent autophagy and inflammatory cytokine production, and plays an important role in host defense against M. tuberculosis. However, the identity of the host sensor for M. tuberculosis DNA is unknown. Here we show that M. tuberculosis activated cyclic guanosine monophosphate-adenosine monophosphate (cGAMP) synthase (cGAS) in macrophages to produce cGAMP, a second messenger that activates the adaptor protein stimulator of interferon genes (STING) to induce type I interferons and other cytokines. cGAS localized with M. tuberculosis in mouse and human cells and in human tuberculosis lesions. Knockdown or knockout of cGAS in human or mouse macrophages blocked cytokine production and induction of autophagy. Mice deficient in cGAS were more susceptible to lethality caused by infection with M. tuberculosis. These results demonstrate that cGAS is a vital innate immune sensor of M. tuberculosis infection. Cyclic GMP-AMP Synthase Is an Innate Immune DNA Sensor for Mycobacterium tuberculosis. Shiloh et al 2015.